KUNDUZ -- About 200 Kunduz residents, including tribal leaders and youth, demonstrated in Kunduz city to call on the Taliban to renounce violence and declare a ceasefire with the Afghan government. Many of those at the gathering, which also included religious scholars, disabled citizens and women, carried copies of Koran in their hands. "Hundreds of us took to the streets today for peace and a ceasefire, and our goal is to ask both parties in the conflict to stop fighting and agree on an immediate ceasefire," Ghulam Haider, a civil society activist, told reporters as he marched in Kunduz city's Central Square on March 16. "For the sake of this holy book... say 'yes' to peace and an immediate ceasefire," Haider said. "How long we will see this bloodshed of our brothers? This is enough war. The public is waiting for peace and a ceasefire." The Afghan government and the Taliban should begin peace talks as soon as possible, insisted participants. "We started our demonstration at the provincial office of the Youth Parliament and marched 2km to the Central Square to raise our voice for justice," Sayed Ghafoor Hashemi, head of the Youth Network in Kunduz Province, said while speaking at the rally. 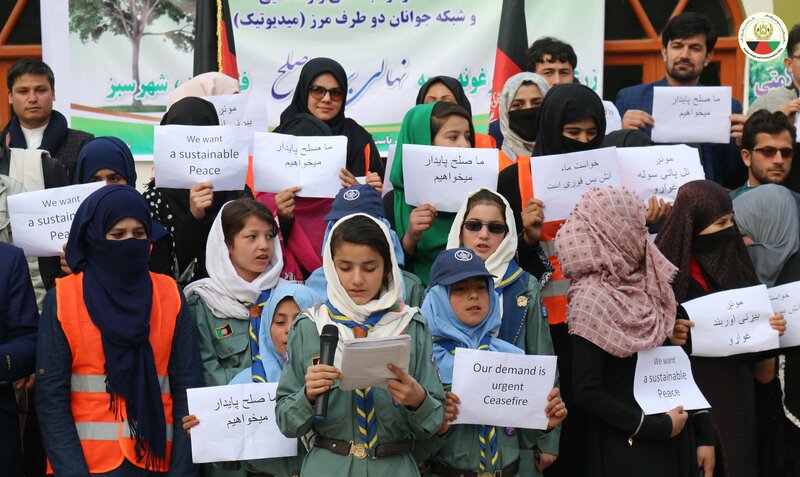 "Today, we walk together with our children and elders, and we ask the Taliban to stop this bloodshed for the sake of the Koran," Hashemi said. "The public can't keep suffering like this. Agree on a ceasefire so that an opportunity can be gained for a lasting peace." Victims of the war with the Taliban also took part in the demonstration, carrying peace slogans and chanting while emphasising that they were tired of the conflict. "We, the disabled, want peace before anything else," Pacha Saeedi, 45, who lost his right leg in 1991 in Chahar Dara District of Kunduz, told Salaam Times. "We ask the government to sit with the Taliban and others and make peace happen. "Afghanistan has been experiencing pain and grief for 40 years. This must stop," he said. For Mahbooba Karimi, 27, another participant of the march, the rally reflects a collective cry for peace by Kunduz residents weary from years of conflict. "We can no longer stand to see tears" in the eyes "of widows, orphans and families without parents -- we must stop this war and bloodshed", Karimi told Salaam Times. "I lost my father in the Kunduz battle three years ago, and now I have voluntarily joined this march so that I can raise my voice and send my message to the Taliban that we are fed up with war," he said. Joining that call were a number of religious scholars and tribal elders who gathered in Sharwali Mosque and lent their support to the continuing peace efforts. "If war can be stopped and a permanent ceasefire can come at the cost of my life, I am ready to make this sacrifice to bring peace to my people and country," Mawlawi Faizullah Aimaq, director of Islamic teaching at the Kunduz Provincial Department of Education, said at the gathering. "Islam encourages Muslims to make peace with each other, and Islam is the religion of peace, not the religion of war and violence," he said. "At this time, the need for peace is at its peak, and we desperately call on both sides to make peace," Aimaq added. "Tribes living in Afghanistan must unite and put effort into bringing peace and stability." "Until the peace talks bear fruit, we call upon the warring sides to declare a ceasefire," Hazrat Ali Ahmadzai, 54, a tribal leader from Kunduz city, told participants at the gathering. "The war has crippled us," he said. "We have been deprived of getting an education. Our economy has been ruined, and our children are left without a future." As peace talks continue, children as well as athletes in the province are uniting in their demand for the Taliban to end the war. 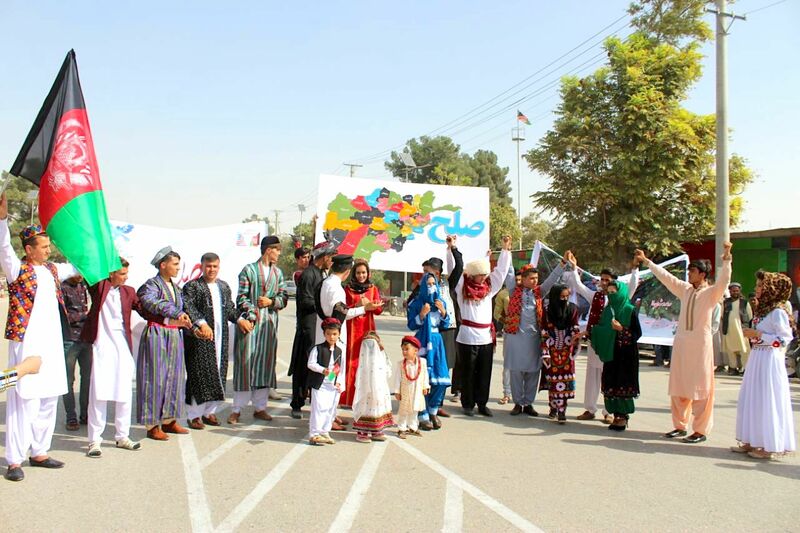 Dressed in traditional attire, the group presented a folkloric fashion show, asking insurgent groups to stop fighting and embrace peace. 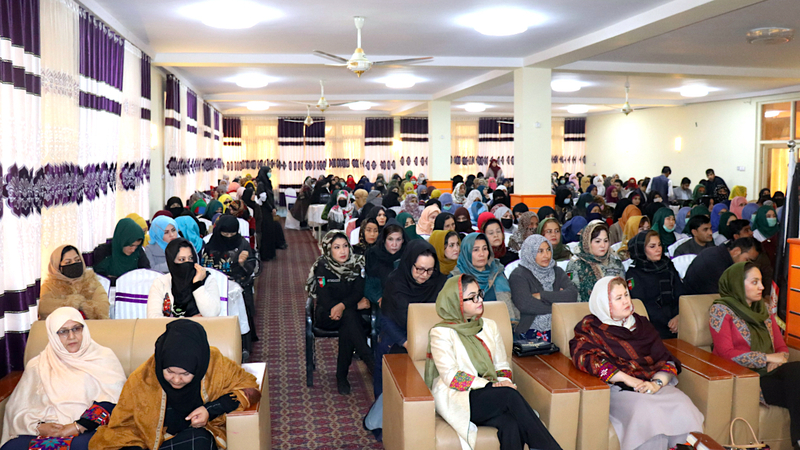 Hundreds of women and women's rights activists united in Kunduz city to call on the Taliban to end the violence and join the peace process.